Guy Beckles is the only celebrated kinetic artist in the English-speaking Caribbean. Math and physics play an integral role in Beckles’ art. 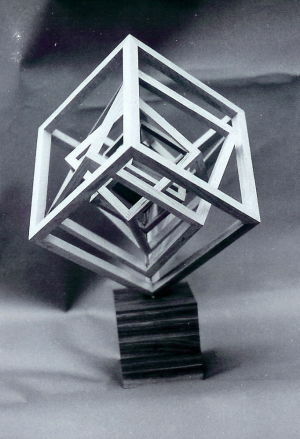 “My love for physics prompted me to do art that moves, utilizing my basic knowledge of gears, levers, pulleys, motors, magnetism, balance and the theory that to every action there is an equal and opposite reaction.” Upon graduation from Dartmouth with a BA in Visual Studies, Beckles returned to Trinidad and taught art for several years to high school students. He continued creating art while teaching until deciding to focus solely on his craft. The kinetic art Guy Beckles creates is subtly influenced by his extensive travels throughout North India, North Africa, Western China and Europe. He has exhibited in London, New York, Washington DC, Boston, Florida, Toronto and his birthplace Trinidad. We are in an age where computer technology penetrates outer-space; information moves speedily and can be stored and relayed …… yet incurable diseases still exist; wars are raging, and famine seems a rather convenient excuse for mega cultures to control the minds of others. The seriousness of the times has been etched on the faces of the people; understandably so because of the anger, pain and sickness which embody this era. It is my hope that this body of work will carve smiles back into the world; to satisfy our inherent need to laugh and have fun. Today, these emotions are too often absent from most people’s lives. My art escorts both adults and children into this uplifting dimension; to propel the mind to wonder about life ……….. to take oneself lightly …………. to include play, fun and games, into one’s everyday existence. It is important to engage the child in us, in order to appreciate the simplicity, the playfulness, the joyfulness, the innocence, the colour in the motion, or the light that emanates because of the motion. What Kinetic Art should teach us, is that ideas do have motion ….. do have life. We have the ability, skill and accessibility to information. The Creator, like the Kinetic artist generates the ideas, and then inspires us to mobilize these thoughts into action. While my Kinetic sculpture has appealed to a wide cross-section of people, my God-given inventiveness, the restless searching kind that it is, has led me to a vision of taking the work into the community. I see it developing into larger-than-life pieces that affect public spaces where people can interact with the work physically, intellectually and emotionally. No man ever creates anything. He simply re-arranges what is already here.